Q: We were pretty much ahead of the curve with the quality of technology in comparison to other schools, weren’t we? It was kind of a cool experience, because they picked us to be one of the teams to do it. 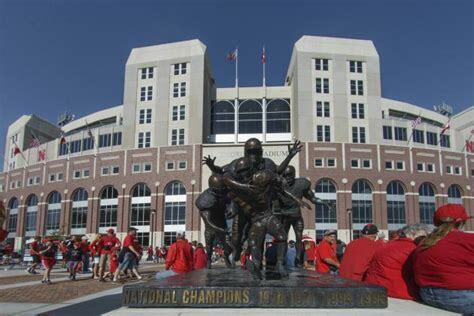 And probably because we were a big name and had been winning a lot, a big program where a salesman could go out and tell other people, ‘Hey, Nebraska uses it.’ We had pretty sweet equipment all the time, but other schools -the K-States and Iowa States?- they didn’t. And we got some crappy film from other schools now and then, but nothing was ever probably intentional. Q: I figured there might have been some backroom gamesmanship and stuff like that. BC: (laughs) No, but I guess they used to do that kind of stuff back in the day, whenever. All the old stuff, it was all on film. That first year I played, we watched film that was actually film, you know? It would break (laughs) and you’d have to stop and tape it back together and deal with all that crap. (laughs) It’s amazing, I don’t know if people realize how far that whole thing has come. 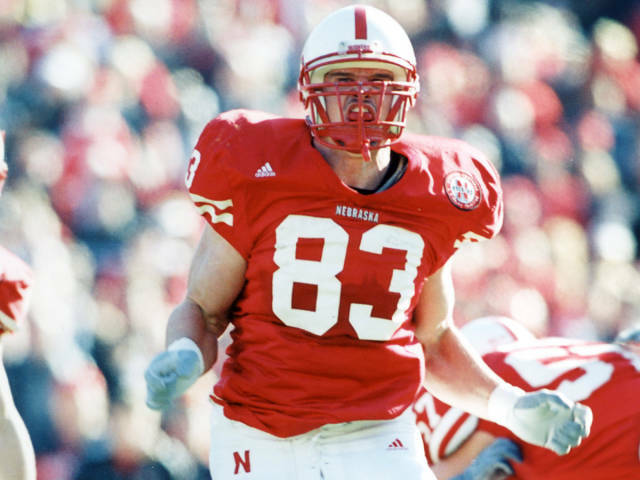 And not to the advantage of just Nebraska now, but everyone in general. BC: Yeah. And Boyd Epley, the stuff you guys were doing and training athletes? Wow. A lot of the stuff you were doing, it’s a lot of the stuff they’re doing now. You would have thought when they brought Dave Kennedy in, when they brought him back…did you work with him? Q: Yeah, I worked with him in ’88 before he left for Ohio State. BC: Well, I always liked Dave, I never had any problem with him when I was playing. In fact, he was one of the few guys I’d go talk to and hang out with when I was still working there, but you’d have thought when they fired all those guys… you would have thought he was back from the Stone Age. The things he was doing? Heavy squats, heavy bench, weighted dips, all the old stuff. And you think about how it is now, they do that training where it’s a little bit of the strength, a little endurance lifting and things like that, you guys were doing that, you know? It’s funny, you were way ahead of your time. BC: Yeah, everybody does it now, but we were the only ones doing it back then. BC: Yeah, a lot of those things. Maybe that’s because there’s nothing else to do in Nebraska. (laughs) But we were the ones who should get the credit. Q: Speaking of, do you have any favorite, funniest occasion from back in those days? You said some guys would come and visit you a lot in the video room? Any usual suspects? BC: Oh, Christian and Jason Peter would come in there a lot. Jared Tomich, a lot of defensive guys, because our office was across from George Darlington’s. We’d get Tyrone Williams, Mike Brown, Ralph Brown would come in there, Mike Rucker, Kyle Vanden Bosch. It was mostly just B.S.-ing. And that was one of the great things, too, just to be able to hang out with those guys all the time. We’d go lift with guys. I don’t know how may video guys got to lift and train with the team. (laughs) We got to do that sometimes. Q: Now that you’re out of the football business, do find any parallels between the game and other facets of life? BC: I still relate to it. Business has something to do with football: ‘You don’t have to overreact about this or that. There are still things here or there that you can work toward, goal setting and seeking perfection.’ I try to put things into that kind of perspective: ‘Hey, we have to work together as a team to get this done.’ If there’s any way to do it, you try to work that teamwork aspect in. And it really works, because people want to be a part of something. It doesn’t matter what you do, if you can get them to feel like they are, everything seems to work a whole lot smoother. It’s the same way where I work now. It’s an open door thing, kind of like the old athletic department in a way. You’ve got to pick different guys, different people, ‘Here’s your offensive coordinator, here’s your defensive coordinator…’, that’s the way I look at it. But what it comes down to is: it takes team effort most of the time to do anything. Nobody does it by themselves. Sure, you might have all the money or make all the decisions, but people still have to get the job done. And you still have to think of the best way to get them to do so. Q: Sure, a unified front accomplishes much, whereas a group in disarray finds its talents dispersed pretty easily? Q: And thinking back to those ’90’s teams, did you see a change in how the offense itself was mutating? Some spread elements being birthed? BC: You know, it’s funny you say that, because all the spread attacks and all these things, I think we were doing that way before anybody was doing it, too. Way back when I was even playing, at the time they had the fullback in the backfield, but you did see kind of a little bit of an evolution. All of a sudden, ‘Hey, we’re in a shotgun. And a shotgun maybe with trips, or all these different sets.’ Only they were running the option out of it, they weren’t reading that dive-read thing that they do all the time now, they were running the option off the end and pitching, you know? And the quarterback runs, too. Q: And that little draw play: that shovel pass now and then? BC: Yeah. And even the throwing plays, you could see all that stuff. 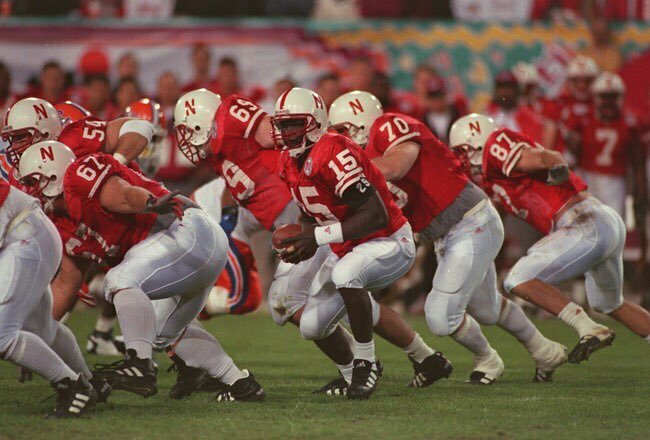 I don’t know how many people would look back and say, “Nebraska, they had something to do with teams switching to this type of attack,” but I guarantee you they did. BC: Well yeah, you look at most all college teams nowadays and they all run some form of the spread anymore. Heck, you hardly ever have the quarterback taking the snap directly from center anymore…in college, at least. The NFL you still do, you know? BC: Yeah, because maybe you’d spread the field out a little bit and create lanes to run in a little better. It was a different way to attack something, and you still ran the same play out of it. It was amazing. It was different sets. 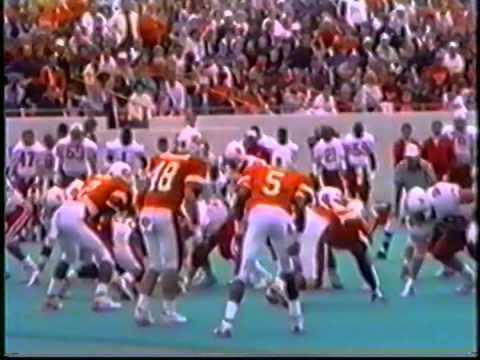 Another thing I thought was really something that they did back in ’93, when we started changing the way they prepared to go to these bowl games. 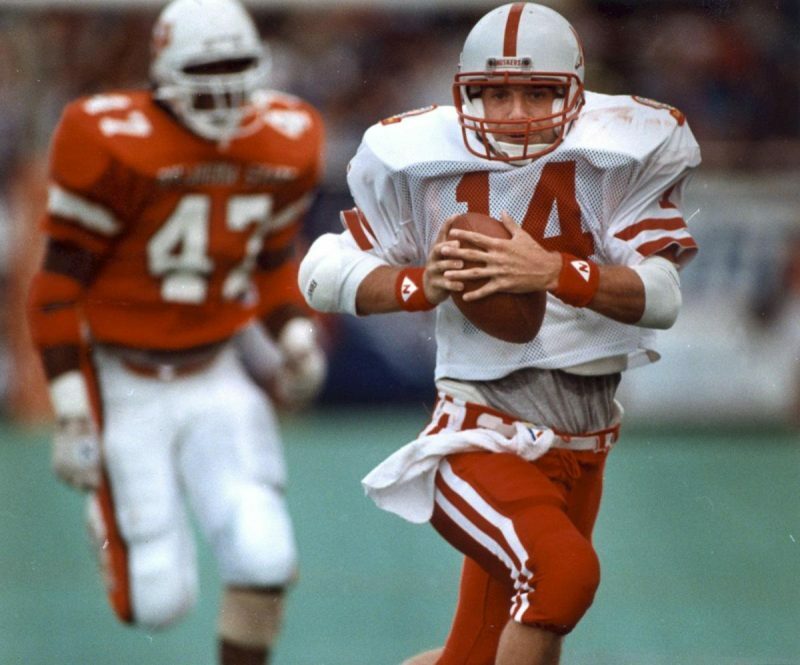 I think a lot of people say that it was simply the way we started recruiting and the change we made in our defense to the 4-3 (and that made big difference in ’93 or whatever), but I think a lot of it had to do with -remember when I was in school you’d get done playing Oklahoma and all of a sudden you didn’t have to do anything for a week? You’d have a week off completely, then you’d come back and start doing some conditioning and running with the strength staff? Then all of a sudden you’d start practicing. So you had two weeks of doing no football, then you’d have a week to practice and go to the bowl game and start practicing and getting ready to play. Well, I think it was like ’93 where all of a sudden we said, ‘We’re gonna start a few weeks early.‘ We practiced hard for a week, let them do their running and do whatever they wanted to go out and do, get all that crap out of their system (laughs), and try to get in a solid week of practice after that with guys being focused. And even after the season was over, you had coaches out recruiting and some guys back in the office, so you’d keep practicing and just run some basic stuff to keep you playing football. I think that played a huge part in getting loose, you know, because we played well defensively in bowl games, we just never played well on offense. Timing and everything was so important, and then you’d come back from not doing anything for two weeks and you’d try to get ready to play. You’d practice three times a week, maybe for an hour, instead of no times. It was good for your head, football-wise. I remember practicing that play, because we didn’t do much of that. We ran that, and I scored a touchdown on the play versus K-State or Okie State or somebody else, also. And we didn’t run it a ton, but we worked on it that week just like we always had it in there. I just didn’t realize we were going to run it the first play of the game. BC: Oh no, this is kind of fun. Q: And speaking of the ’90’s atmosphere and some things that took place after your senior year, what do you think about all the Unity Council and those types of things thereafter? BC: I never was a part of any of that Unity Council stuff, other than when I worked there I’d sit there in the staff meeting and they were talking about it and implementing it. It was an important thing for Coach Osborne, and it was a big deal to get that going. I think it really gave the players an idea that they really had a say in something instead of just having somebody telling them what to do all the time. BC: Sure, they felt more of a part of some of the decisions. They felt they might like to have a say in some things: they might be able to decide on a bowl gift-type of thing, or “How does everybody feel about having a practice this many times in an off week?” They had all kinds of things that came up in that. I don’t know if they still do the same stuff there now, but that was a big deal. Q: So I have to ask you, is there any unsung hero, someone behind the scenes who contributed in a grand sense? BC: You know, I was always a big fan of George Sullivan, and maybe that had to do when I was playing. I always felt he was a guy who would push guys to make sure guys practiced, he was a guy you could to talk to if something was wrong. A lot of those trainers were kind of like a bartender. (laughs) You could go and talk to them. It always seemed like they listened and heard about what you were doing, what you had going on in your life, and Sully always seemed like a great guy. You know, if you got sick and you went down there they’d get you in to the doctor and do whatever they could do to help you out and cared about everybody. 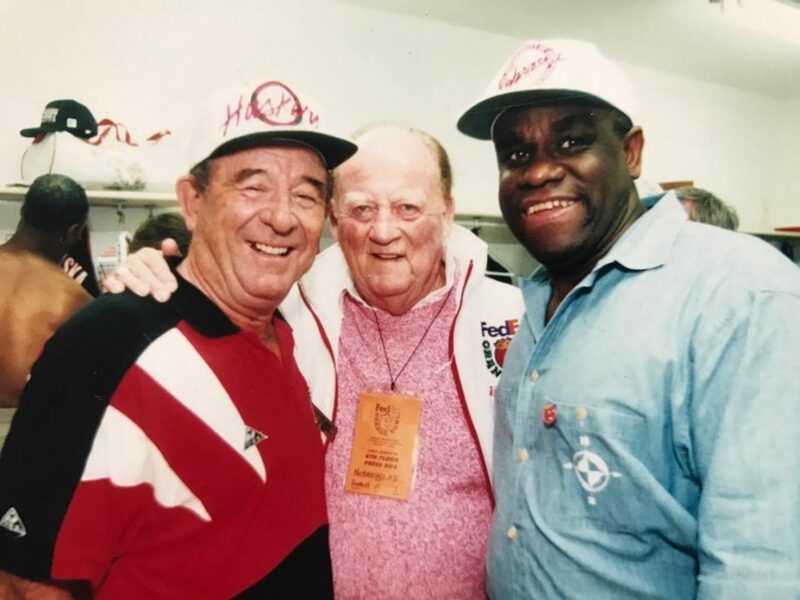 Sully, Weber and Doak, they were all that way. Maybe I say ‘Sully’ because he was sort of like your grandpa: big old hands, he just cared about everybody a lot. He was a guy, somebody that was different than a coach, you know? And that was another thing, it’s important to have those guys like that. Q: Because the NCAA mandated that coaches could only spend so may hours per week with the kids, right? BC: Yeah, exactly. So the trainer probably spent more time with them than the coaches. I mean, you guys spent a lot of time with them. Q: We all did what we could, huh, Bryan? So, have we failed to touch on anything else that set those championship teams apart? BC: I just think that everybody had kind of a good rapport. For whatever reason, there was a good group of people that worked together and wanted to be a part of something big. I think once they got a taste of being good, it seemed to make it even more special. It wasn’t even surprising they won it again (in 1995). Heck, they probably should have won in three or four years in a row. BC: Yeah, and that’s probably why it worked. Once the formula kind of got figured out, then BOOM!, it just kept going. 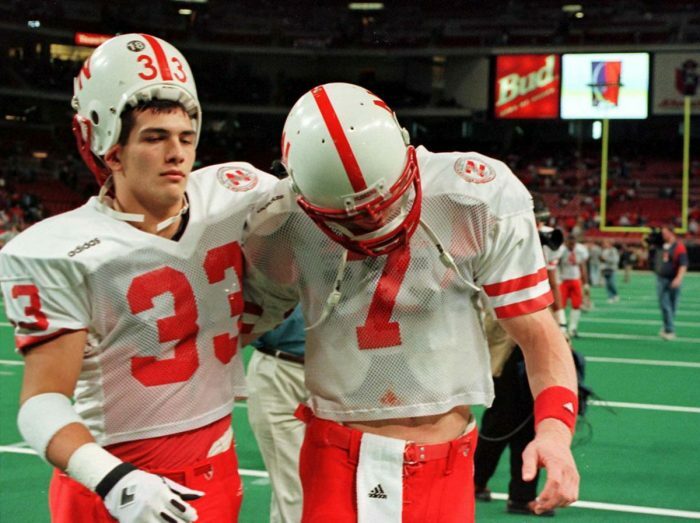 Whether the harnessing of digital computer technology played a large role in the success of University of Nebraska Football is a point beyond debate. Why, you say? Well, first came Boyd Epley and staff’s use of the micro-computer in devising, calculating and monitoring individual player’s weight training programs. 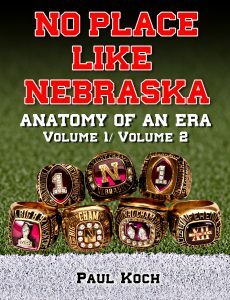 In those days Nebraska used what was known as a split-routine training regimen, which involved working one muscle group or body part twice per week via lifting exercises. Let’s say you wanted to build muscle strength, size or power: you would work that muscle two times per week, on a Monday and then again on Thursday. But the amount of weight lifted could not be the same on both days. Why? Well, despite football’s extremely violent nature seeming to prove otherwise, the human body is actually a very delicate organism -especially when it comes to bouts of stress and needing accompanying recovery from that stress. As a matter of fact, it’s far easier to over-train an athlete than under-train him for peak performance, so it’s a fine line to walk with each human body on the team. Behind the scenes -through trial and error, as well as study of scientific journals- Mike Arthur and company realized that if you worked a muscle super-hard on Monday to the point of failure that you only had to give it a little nudge a few days later at a lesser load, or stress level. In doing so, the muscle actually grew stronger and/or sizeable with just the right intensity of weight load. In order to accomplish this herculean and intricate task of maintaining a homeostasis between eustress and alarm mode, every week’s workout would contain the exact amount of weight to place on the bar for each set the athlete performed. Using the One Repetition Max concept (a mathematical algorithm) a list of exercises and their weightloads were easily tabulated for the training week. What resulted was an individually produced lifting regimen for every person, producing maximum gains without threat of overload and injury, also allowing progress to be tracked much that much easier. 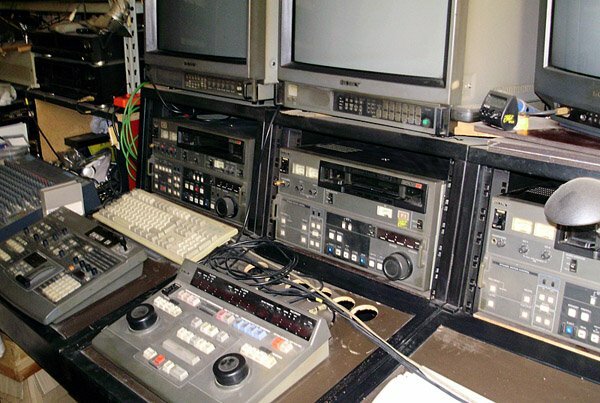 The PC and Apple IIE and the Macintosh were hard at work crunching the numbers on floppy disks deep in the strength staff offices while the Ends and lines and DB’s were crushing opponents with their muscle and power on the field of play. Strength training’s use of technology aside, the later advancement and last piece of the puzzle came in the form of digital video, as Bryan explained above. You could bet good money that the coaching staff of the day depended heavily on the work of Carp and Moose and their digital video preparation. Just imagine all those past years of watching and wasting crucial minutes of game planning and practice evaluation running a projector back and forth, back and forth, a light bulb going on the fritz, the film burning up from resting near an overheated bulb, or having to splice together a brittle run of the celluloid while the kids soon lost focus, full attention, or the ability to keep from nodding off in the dark for a few extra zzz’s. The process of film evaluation made a quantum leap, as if stepping off a John Deere riding lawnmower and directly into a Porsche 911 GT2 RS. It was that profound a jump in both speed, precision, and handling of the information at hand, and not only did it allow from more precise game preparation, but better yet took less man-hours to accomplish it. Imagine the added hours it contributed to recruiting, for time spent with the athletes, for family, for rest. There is a world of difference between a football guy doing technology and a technology guy doing football. Bryan mentioned, “I think it was probably an added benefit to the coaches that we understood, and we could enter that information and edit something easier just by knowing what everything was…We gave them exactly what they wanted…(and) you had one more set of eyes looking at something.” Moose and Carp were the crucial extra set of eyes for this team. To end, I feel it’s only right and proper to acknowledge the use of a word we’ve heard once before: Grandpa. The cynic might think of an aged staffer as a dinosaur, a lifer, a hanger-on who doesn’t know when to quit, an old salt who still has a little get up and go when others would have supposed they should have got up and went, whereas the humanitarian in us would call them sages, learned men, experienced, all-knowing and full of wisdom. I’d like to think the latter fit the bill when it came time in recognizing the contribution of George “Sully” Sullivan: “I say ‘Sully’ because he was sort of like your grandpa: big old hands, he just cared about everybody a lot. He was a guy, somebody that was different than a coach, you know? And that was another thing, it’s important to have those guys like that.” There was great value in having some of those elder, stately types roaming the halls, firm and resolute in their sense of right and wrong, knowing black from white and calling out a lot of gray so prevalent in many a young man’s world. George was always “kickin’ it old school,” and he was a steadying force in that day and time.